James Beard Award Winner: Best Baking and Dessert Book of 2011! Jeni Britton Bauer is an American ice cream maker and entrepreneur. A pioneer of the artisan ice cream movement, she introduced a modern, ingredient-driven style of ice cream making that has been widely emulated across the world but never duplicated. Britton Bauer opened her first ice cream shop, Scream, in 1996, then founded Jeni’s Splendid Ice Creams in 2002. Her first cookbook, Jeni’s Splendid Ice Creams at Home, is a New York Times and Wall Street Journal bestseller and a James Beard Award winner. 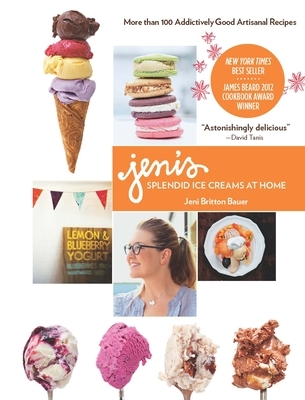 Her second cookbook, Jeni’s Splendid Ice Cream Desserts, takes ice cream to the next level with an extraordinary array of plated, layered, and piled-high ice cream–centric desserts. Today, Jeni’s Splendid Ice Creams is a Certified B Corporation with 34 scoop shops, an online shop at jenis.com, and distribution in top grocery stores across the country. Follow Britton Bauer on Instagram @jenibrittonbauer.